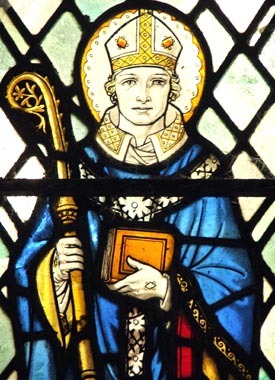 St. Piran is the most popular of the Patron Saints of Cornwall (the others being St. Michael and St. Petroc). His family origins are obscure, but the tradition that he came from Ireland is extremely strong. Misguided medieval hagiographers identified him with St. Ciaran of Saighir. Though the two names are arguably the same, an identification with St. Ciaran of Clonmacnoise, whose father is said to have come from Cornwall, is much more likely. Piran's father and mother are both given Irish ancestries. However, his father's name, Domuel, is certainly British and he was probably Prince Dywel ap Erbin of the Royal House of Dumnonia. Piran spent his younger days in South Wales, where he founded a church in Caer-Teim (Cardiff). He probably received his religious schooling at the monastery of St. Cadog in Llancarfon where he would have met St. Finnian. Piran's mother being of Irish blood, the two presumably got on well and returned together to Ireland where Finnian founded some six monasteries, including his most famous one at Clonard (Meath). Piran-Ciaran lived here before moving on to live with St. Enda on Aran Island and then St. Senan on Scattery Island. He finally founded his own community at Clonmacnoise, "Ireland's University". Cornish legend tells how, in old age, Piran was captured by the local pagan Irish. Jealous of his miraculous healing powers, they tied a millstone around his neck and threw him off a cliff and into the sea during an horrendous storm. As Piran hit the water, the storm abated and the millstone bobbed to the surface as though it were made of cork! With his new-found raft, Piran set sail for his homeland of Cornwall. He landed at Perran Beach, to which he gave his name, and built himself a small oratory on Penhale Sands at Perranporth, where he performed many miracles for the local people. It was excavated from the dunes during the 19th century, but has recently been reburied for its own protection. He was eventually joined by others seeking solitude and so established the Abbey of Lanpiran. Piran's rise to be Cornwall's Patron stems from his popularity with the Cornish tin-miners. It is said that Piran himself first discovered tin in Cornwall (or rediscovered what the Romans knew well) when he used a large black Cornish rock to build himself a fireplace. He was amazed to find that, as the flames grew hotter, a trickle of pure white metal began to ooze from the stone. He shared this knowledge with the local people and thus provided the Cornish with a lucrative living. The locals were so delighted that they held a sumptuous feast in Piran's honour where the wine ran like water. Piran was fond of the odd tipple and he is still remembered today in the Cornish phrase "As drunk as a Perraner". The trickling white metal upon its black background, however, remains his most enduring memorial as the White Cross of St. Piran on the Cornish National flag. Piran founded churches at Perranuthno and Perranarworthal, and a chapel at Tintagel. His holy-well, the "Venton-Barren" was at Probus. He probably also made trips to Brittany where he became an associate of St. Cai. Here, Piran is remembered at Trézélidé, St. Peran, Loperan and Saint-Perran. Arthurian tradition, expounded by Geoffrey of Monmouth, says that he became chaplain to the great King Arthur and was made Archbishop of Ebrauc (York) after St. Samson was exiled by Saxon invasions. If so, it seems unlikely that he ever properly took up his Archiepiscopal See. Traditionally, Piran died at his little hermitage on 5th March though, as this is St. Ciaran of Saighir's Day, his true feast day may have been the 18th November as found in the Launceston Church Calendar. His relics were a great draw to pilgrims but, due to inundation by the sand, they were eventually moved inland to where the Parish Church of Perranzabuloe (St. Piran-in-the-Sands) was built to house them.